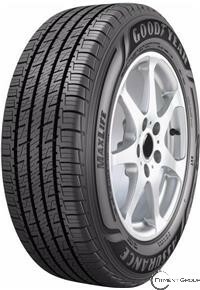 The Assurance MaxLife is Goodyear's Standard Touring All-Season tire developed for the drivers of sedans, minivans, crossovers, and coupes looking for a tire to help conserve fuel, prolong tread life and provide all-season traction in dry, wet and wintry conditions, even light snow. "- Unique treadwear gauge that shows how much tread life remains as the tire wears, allowing drivers to conveniently read their tread depth through built-in wear gauges at any time. - Bolstered by Goodyear's TredLife Technology, the tire delivers up to 30 percent more miles of all-season traction compared to the standard all-season tire." - The Goodyear Assurance MaxLife also features a unique treadwear gauge that shows how much tread life remains as the tire wears, allowing drivers to conveniently read their tread depth through built-in wear gauges at any time.